Waves of Early Fall design is a Bargello counted needlework embroidery presented within a 40-plus page booklet. This design utilizes the traditional Bargello method of needlework straight stitches worked in steps to create the design. 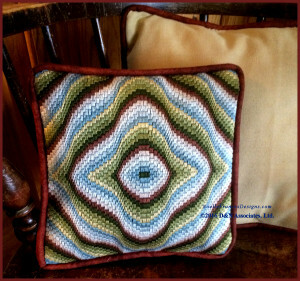 Click the button named Bargello on the upper navigational bar of my blog website at Noelle Frances Designs to view my discussion of the fabric that I used, the Bargello straight stitch and how to start and end your stitching thread without the use of knots. I wanted to create a pillow top of Fall colors that would draw the eye in and have the optical illusion of movement. My design inspiration came from looking out across our deck to a neighbor’s rolling hillside of trees. Below the grayish blue skyline, in the dense area of the woods, the early fall colors of greens and rust colors seemed to roll away from me in gentle waves. 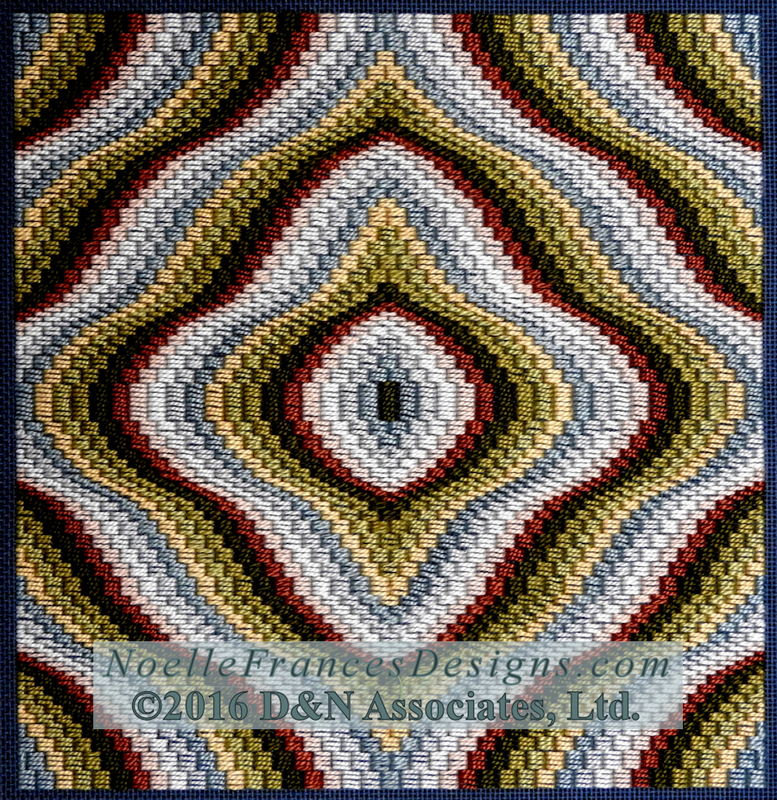 It took a bit of trial and error but I feel I captured this view of rolling colors in my Bargello needlework design: Waves of Early Fall. 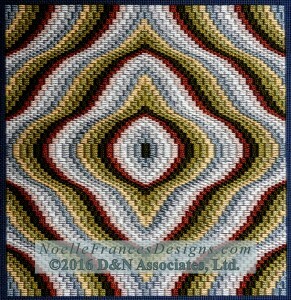 This wave Bargello design may look complex, but this design is easy to stitch when you follow my booklet’s numerous pages of zoomed-in charts and photos. My booklets are divided into sections that discuss the main pattern parts of each design, present photos and graphed charts in color and close-ups so you can see the details. Within the e-book format you can expand the charts and photos throughout the booklet to view details down to individual stitches. Waves of Early Fall design is 164 x 157 count which is approximately 9.5 by 9 inches on 18 count mono canvas fabric. My booklet Waves of Early Fall, 40-plus pages in length, is offered in e-booklet format and printed as a 8 by 10 inch paper bound booklet. Click the below photo for ordering or to access the Look Inside feature to view a few pages of the booklet for the Waves of Early Fall design.